Price is a big barrier standing between so many people and the robot vacuums they deserve. Seriously, why should you have to clean up all that dust and dirt when a robot can do it for you? 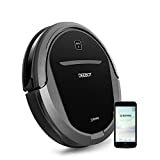 If you’ve been eyeing the ECOVACS DEEBOT M81Pro Robotic Vacuum Cleaner and waiting for the right moment to pounce, this is the right moment. Amazon’s deal of the day slashes $100 off the price of this great robot vacuum, so grab one at a deep discount while you still can. Large capacity dustbin for less frequent emptying. Includes 1 year manufacturer’s warranty and extra accessories kit.